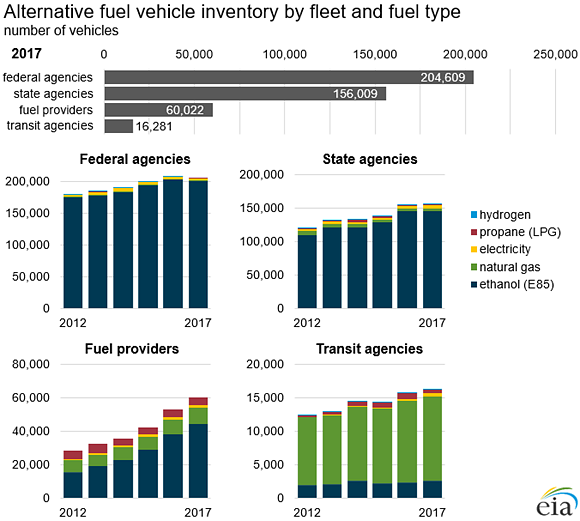 The U.S. Energy Information Administration (EIA) publishes annual data about fuel use and the number of vehicles in inventory for four types of alternative fuel vehicle (AFV) fleets: federal government, state governments, transit agencies, and fuel providers. The total inventory and fuel used by these four types of fleets do not represent the U.S. total for AFV inventory and fuel use. These values should not be aggregated. In 2016, the federal fleet maintained an inventory of nearly 208,000 AFVs. A total of 97% of these vehicles are E85-capable flexible-fueled automobiles, SUVs, and trucks. The U.S. Postal Service accounted for 47,000 of the 202,000 E85 vehicles in the fleet, and Department of Homeland Security accounted for slightly more than 26,000 E85 vehicles.E85-capable vehicles have historically been the most widely available AFV for fleets to meet the federal mandates and executive orders that require AFV acquisition and alternative fuel use. State agencies have similar shares of vehicle types as the federal government. Most of the 155,000 AFVs in the total state fleets are light-duty vehicles, and 85% are E85-capable. Similar to the federal fleets, state agencies tend to use flexible-fuel vehicles to save money at the pump and to reduce the impact of the state fleets on energy consumption and the environment. Overall growth in AFVs also stems from the EPAct requirements about acquisition of AFVs in their fleets established in the State and Alternative Fuel Provider Fleet Program. Transit agencies primarily have heavy-duty buses for mass transit in metropolitan areas. Of all alternative-fuel buses in use, natural gas is by far the most prevalent fuel in fleets. In 2016, transit agencies reported an inventory of nearly 16,000 AFVs, and about 12,000 of those AFVs were heavy-duty buses that consumed 119 million gasoline equivalent gallons of natural gas. Natural gas-powered vehicles require less maintenance than standard-fuel vehicles because of cleaner burning engines, which result in lower emissions and cleaner environments. Fuel providers are companies whose products also qualify as alternative fuels (i.e., electricity, natural gas, and propane). With some exemptions, under federal law these companies must include AFVs in their annual purchases of light-duty vehicles. Of the 53,000 AFVs reported in use by fuel providers in 2016, nearly 72% were E85-capable flexible-fuel vehicles, again as a result of the availability of the vehicles and the proximity to refueling infrastructure. Overall, fuel providers have shown steady growth in AFV inventory over the past five years with an 85% increase in fleet size since 2012. Growth in AFVs also stems from the EPAct requirements about acquisition of AFVs in their fleets established in the State and Alternative Fuel Provider Fleet Program. What is the AFV data collection requirement? Because EIA only publishes information about four fleets, we no longer publish national totals on the number of alternative fueled vehicles or on fuel consumption. The supply of AFVs (either manufactured or converted) also includes vehicles such as gasoline-electric hybrids and diesel-electric hybrids. These data are published in the Supplier data section, but they are not included in the User data section because they are not considered alternative fuel vehicles under the Energy Policy Act of 1992.